For Heaven’s Sake by John Edwards is the second part of his autobiography. His story began in book one Walking Free. John Edwards talks honestly within his book. He talks about God and the desire for us all to know Him. “I qualified for Heaven because of Jesus Christ’s sacrifice.” This desire has meant John has done amazing things to reach others. He has walked all over Britain, Ireland and America carrying an eleven foot cross, a lightweight coffin and a five foot syringe… although not all at the same time. “People do not so much see me but they see the cross.” These are all starting points for conversations. John Edwards lives with a heart open to God. It is “important to pay attention to these promptings of the Holy Spirit; people’s lives may depend on it.” John listens, acts and obeys when he hears God’s voice. 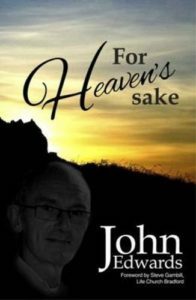 For Heaven’s Sake is a truly amazing read. John Edwards is an ordinary person who has done extraordinary things for God. You have to read this book – it is inspiring. God bless you John and Tricia.